Come to Darien Library on Mondays, starting Oct. 22 for a four-week series on the “The Civil War: Revolt of the Planters” and learn about the tension between those who enlist the agrarian agenda and those that desire to industrialize. Each lecture takes place from 3 to 4 p.m. on Mondays, beginning Oct. 22 in the Community Room at Darien Library. We the People was based on the ability to own land, yet the threat posed to the landed interests by Northern merchants and industrialization was evident with the founding of the Nation. The stage was set for the contradictions posed by the Jeffersonian versus the Hamiltonian doctrines for political primacy. Join us for week two as we discuss Slaveocracy of the American Gulag, class structure of the Antebellum South, Manifest Destiny and the unfolding decline of Southern political power. All of which leads to burgeoning Southern radicalism and the secessionist movement. 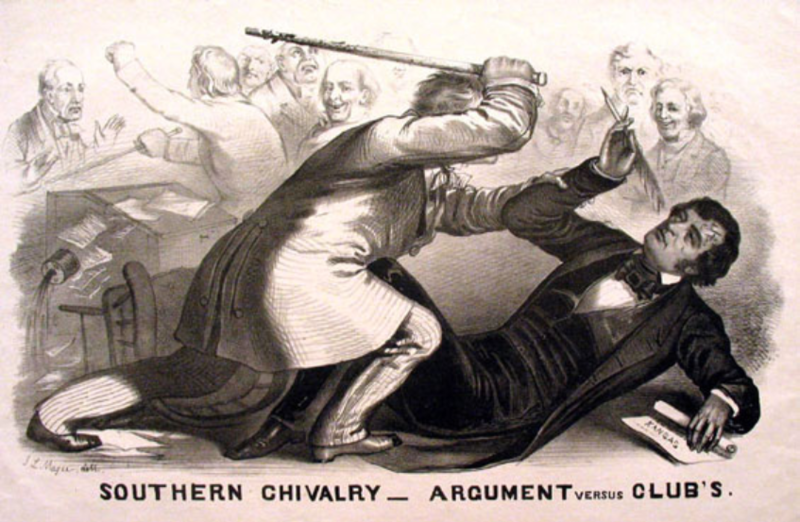 A lithograph cartoon depicting Preston Brooks’ attack on Charles Sumner in the U.S. Senate chamber on May 22, 1856. The Confederacy was a revolution from the Right; an attempt to insure the primacy of a restricted clique of Land Gentry and the notion of Cottonism. Like the Fascists in Italy and the Nazi Revolution in Germany, the Southern Aristocracy represents that Rightist repugnance for the ideals of the Age of Reason/Enlightenment. The Boyars of Cotton are unable to staunch the tsunami of revision sweeping through the 19th century. The Goetterdaemerung of the Southern Aristocracy presaged the cataclysm to come, the mass extinction of the once inviolable houses of royalty in 1918, as the tides of modernity washed away the decay of antiquity. Mark Albertson is the historical research editor at Army Aviation magazine and is a long-time member of the United States Naval Institute. In addition, Mark teaches history at Norwalk Community College. His courses include: World War I and Iraq: Creation of Colonialism; A History, Vietnam; A History, World War I; The Turning Points of World War II; The Great Patriotic War: The Titanic Clash Between Nazi Germany and the Soviet Union; and American Empire: Grand Republic to Corporate State. In May 2005, Mark was presented with a General Assembly Citation by both houses of the state legislature in Hartford for his effort in commemorating the centennial of battleship Connecticut.